There are 27 species of bats found in New Mexico and 19 are listed for protection through Federal or State regulations. Of these 27 species, 13 are found within the Sacramento Mountains. These bats live in all vegetation types and elevation ranges. Water availability, down woody material, and snags are all important habitat components for bats. Bats are an essential, beneficial part of the Sacramento Mountain ecosystem. Bats play critical roles in insect control, plant pollination, seed dissemination, and cave ecosystems. Consuming over half their body weight in insects each night, bats are the major predator of night-flying insects. Bats in the Sacramento Mountains can eat thousands of tons of insects nightly. Cave-roosting bats are important because bat guano provides vital„ nutrients for cave ecosystems, and is often the basis of a cave’s food chain. Bat guano is used by micro-organisms and invertebrates, which become food for fish, salamanders, frogs, and other larger animals. They are even food for other animals, including hawks, racoons, skunks, and owls. Imagine if you couldn’t see the bat emergence from Carlsbad Caverns anymore or if local agriculture producers couldn’t depend on bats to keep insects from destroying their crops? This could happen if bat populations become affected by a new disease called White-nose Syndrome (WNS). White-nose Syndrome has devastated bat populations across the eastern United States during the past four years, and according to biologists, has caused the most abrupt wildlife decline in the past century in North America. 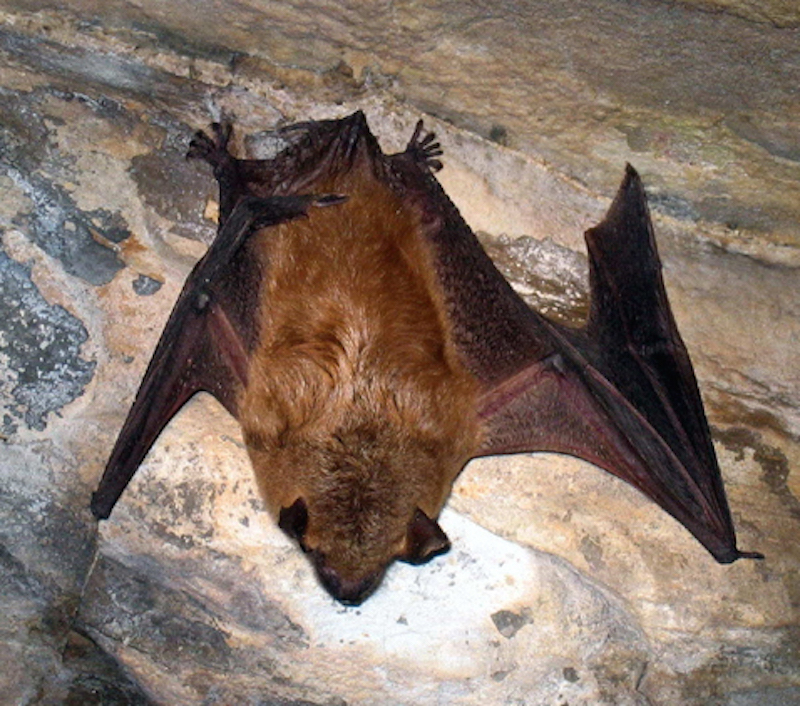 Since WNS was discovered in a single New York cave in February 2006, more than a million hibernating bats of nine species have been killed by the disease in fourteen states. White-nose Syndrome has now moved into Canada, Maryland, Tennessee, Missouri, and Oklahoma. Ultimately, bats across North America are at risk. WNS has not currently been documented in New Mexico. White-nose Syndrome causes bats to awaken more often during hibernation and use up the stored fat reserves that are needed to get them through the winter. Infected bats often emerge too soon from hibernation and are often seen flying around in midwinter. Bats affected by WNS basically starve to death, but scientists don’t know what is triggering the starvation. Studies are under way to determine if the bats are going into hibernation underweight or if they lose their body fat at an accelerated rate during hibernation. If bats lose more body fat than normal during hibernation, they do not have the energy reserves to survive until spring. If they are going into hibernation underweight, scientists will explore the possible reasons for this. Scientists are studying how WNS is spread. Bat to bat tŒransmission of Geomyces destructans has been documented in lab conditions and the geographic pattern of spread appears to support lab findings. Aspects of the geographic spread suggest that humans may transmit WNS from infected sites to clean sites. This kind of spread is most likely occurring from clothing and equipment that are not properly cleaned and decontaminated between sites. Formal testing of human-spread WNS is ongoing. Because of the devastating effects of WNS, it is critical that people assume responsibility for the potential spread of WNS. If anyone is interested in WNS or what can be done about preventing its spread you can look up the US Fish and Wildlife Service website: www.fws.gov/whitenose syndrome. There are over 1100 known species of bats, just about 25% of all mammal species. Most of these bats are small enough to fit in the palm of your hand. Bats are very clean animals, and groom themselves almost constantly (when not eating or sleeping) to keep their fur soft and clean. This article originally appeared in the February 2011 print edition of the Mountain Monthly.